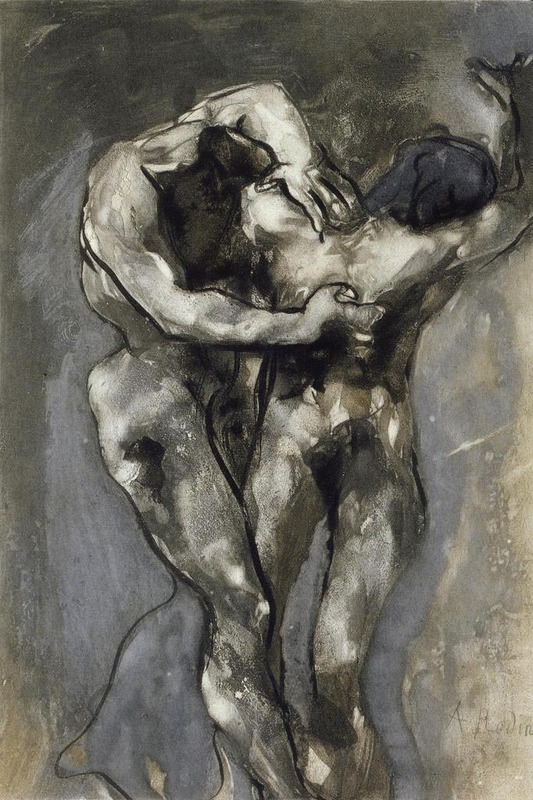 In 1897, the House of Goupil published a limited edition of one hundred and twenty-five copies of an album which caused a great sensation: the drawings of Rodin inspired by Dante's Divine Comedy. The House of Goupil possessed no. 38 (inv.90.III.2.1) of this work, entitled The Drawings of Auguste Rodin, and also known as the Fenaille Album due to the name of the artist's patron. This assemblage includes twenty-nine photoengraved plates after drawings mainly dating from the 1880s which Rodin executed while he worked on The Gates of Hell. The Goupil Museum also preserves the press proofs that were used in its production. The press proof is the proof submitted for the approval of the artist: when it is correct it is signed by the artist. This is the press proof for plate 10, after the drawing "The Heretics", signed by Rodin. This image relates to the first circle of Dante's Inferno in which those who have been violent towards God and man are punished. The powerfully rendered shadows seem to be torn apart by a struggle that is as useless as it is eternal. "The Heretics", by Auguste Rodin (c) mairie de Bordeaux photo D.R.